Celebrating the 4th of July with fibre-based fireworks I’m having a little party and you’re all invited. 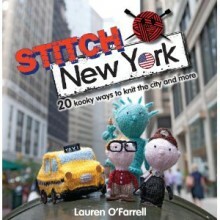 Meet the Stitch New York knits! Stitch New York’s little big city knits will be strutting their stitched stuff at the Royal Fesitval Hall’s Sunley Pavillion (third floor) on Thursday 4th of July. Sing Moon River with Handmade Holly Golightly, worry about life with Woolly Woody Allen and get carried away by crafty King Kong. This will be your chance to see the knits in person, meet the author and Stitch London founder Lauren ‘Deadly Knitshade’ O’Farrell, and get your copy of the book signed just for you. There’ll also be an exhibition of all the makes from the Stitch London book, so you might just get chance for a chinwag with The Queen and her tiny corgis, or a tweet from Cooey the Pigeon.